After the unexpected death of her parents, shy and sheltered Ginny Selvaggio, a young woman with Asperger’s Syndrome, seeks comfort in family recipes. But the rich, peppery scent of her Nonna’s soup draws an unexpected visitor into the kitchen: the ghost of Nonna herself, dead for twenty years, who appears with a cryptic warning — before vanishing like steam from a cooling dish. A haunted kitchen isn’t Ginny’s only challenge. Her domineering sister Amanda insists on selling their parents’ house in Philadelphia, the only home Ginny has ever known. As she packs up her parents’ belongings, Ginny finds evidence of family secrets she isn’t sure how to unravel. She knows how to turn milk into cheese and cream into butter, but she doesn’t know why her mother hid a letter in the bedroom chimney, or the identity of the woman in her father’s photographs. The more she learns, the more she realizes the keys to these riddles lie with the dead, and there’s only one way to get answers: cook from her parents’ recipes, raise their ghosts, and ask them. Her hand is close to my arm. My options are limited. I can’t run away. I can’t handle this. I lose myself in food. The rich, wet texture of melting chocolate. The way good aged goat cheese coats your tongue. The silky feel of pasta dough when it’s been pressed and rested just enough. How the scent of onions changes, over an hour, from raw to mellow, sharp to sweet, and all that even without tasting. The simplest magic: how heat transforms. I think we’ve established that there are a lot of food references in The Kitchen Daughter but it’s more than just about food – it’s also about Ginny coming to terms with the death of her parents and in the process, learning more about herself and her family. It was interesting being inside Ginny’s head because she’s such a unique character. Right from the start, the reader knows that there’s something different about Ginny. When asked if she has a condition or anything, she says that what she has “is a personality.” I liked that the story is told from her perspective because it gives us an inside look of how she processes everything around her. It makes me realize that I take so many things for granted in my life – that I’m not socially awkward, that I’m not bothered by physical contact, which I think is a big thing when you live in the Philippines because people have no respect for personal space around here (e.g. public transportation). So even if I don’t think I have a lot of things in common with Ginny, I could still sympathize with her. 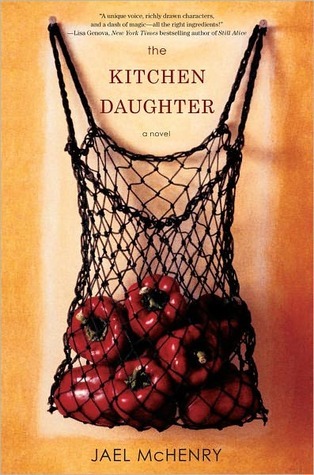 I feel like The Kitchen Daughter is a quiet sort of novel because it’s mostly about Ginny and her internal struggles – how she copes with everything that happens in her life and how she tentatively reaches out to the secondary characters. It’s a book about relationships between family members and between friends. It’s also about the intricacies of life – how people have different ways of handling grief and sadness. The Kitchen Daughter is a heartwarming read and a well-written debut novel, the kind of book that you read during a weekend afternoon when you want to get cozy. I’m looking forward to seeing what Jael McHenry has in store for us next. Even though I didn’t fall in love with Patrick Ness’ The Knife of Never Letting Go, I enjoyed it enough to read his other books. 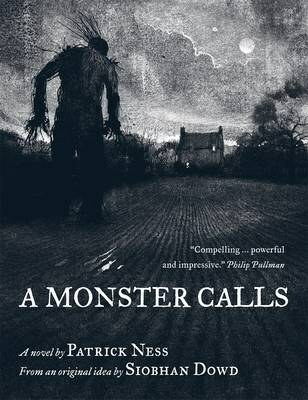 I’ve seen rave reviews of A Monster Calls so I decided to request a copy from NetGalley when it became available there. I finished reading this book weeks ago and I’ve let a draft of my review rest in my dashboard, hoping that I’ll be able to write something substantial while the dust settles. I admit defeat, nothing that I can write will do this book justice. This book should come with a warning: “Avoid reading this in public places because it will make you cry.” I should have known better than to read A Monster Calls in Starbucks while waiting for friends. I figured I was immune to Patrick Ness’ emotional punches since I remained tear-free while reading The Knife of Never Letting Go. I was wrong. I don’t think I’ve ever mentioned it here on the blog but back in January 2007, my dad was diagnosed with stage three lung cancer. Five months later, he passed away. I don’t talk about it here because I used to think it’s too personal but I want to share why this particular book resonated with me. To say that I could relate to Connor is an understatement. I wanted to go inside the book and hug him to let him know that he isn’t alone in his pain. And I’m pretty sure I’m not the only one who felt that way. In a world where cancer is becoming more common, I feel like it has touched the lives of almost everyone – be it through a family member or a friend. I’ve lost count of the number of wakes and funerals that I’ve attended because someone lost his or her battle to cancer. I’m thankful that Patrick Ness decided to write this novel because it articulates what so many of us can never put into words – all the anger, the hopelessness, the fear and yes, the denial because accepting the truth is never an easy thing. And that’s what the monster wants from Connor: for him to reveal the truth because he can never move on if he can’t even admit it to himself. This a contemporary middle grade or younger YA novel and only the presence of the monster adds a touch of whimsy to the story. You don’t have to be a Patrick Ness fan or a middle grade/young adult reader to appreciate this book. What Connor experiences is something that every human being will understand. You know that feeling when a book does a better job of describing how you feel? A Monster Calls is that kind of book. Just thinking about it while writing my review brings to the surface all the emotions that I felt while reading Connor’s story. Ever since I started the blog, I’ve become drawn to well-written, emotional reads that deal with grief and maybe it’s because of my own experience, maybe I’m trying to find the words to illustrate how I felt in the books that I read. I’m fond of quoting C.S. Lewis, “We read to know we’re not alone” because it’s true. A Monster Calls makes me feel that I’m not alone. So thank you, Patrick Ness, I know you already have numerous fans but I just want to say that you’ve gained another one and I will read everything that you’ve written and everything else that you will write. I need to buy an actual copy of this book so I can read it over and over again. 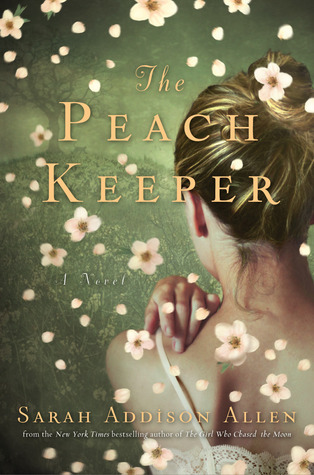 The Peach Keeper by Sarah Addison Allen is one of my anticipated releases in 2011. I have loved Sarah Addison Allen’s books ever since I read Garden Spells. Her books are my first foray into magic realism and I keep saying I should read more from the genre but I haven’t had the chance to do so. I couldn’t help but read The Peach Keeper as soon as I could get my grubby hands on it because I knew I was going to like this one just as much as her other novels. It’s the dubious distinction of thirty-year-old Willa Jackson to hail from a fine old Southern family of means that met with financial ruin generations ago. The Blue Ridge Madam — built by Willa’s great-great-grandfather during Walls of Water’s heyday, and once the town’s grandest home — has stood for years as a lonely monument to misfortune and scandal. And Willa herself has long strived to build a life beyond the brooding Jackson family shadow. No easy task in a town shaped by years of tradition and the well-marked boundaries of the haves and have-nots. But Willa has lately learned that an old classmate — socialite do-gooder Paxton Osgood — of the very prominent Osgood family, has restored the Blue Ridge Madam to her former glory, with plans to open a top-flight inn. Maybe, at last, the troubled past can be laid to rest while something new and wonderful rises from its ashes. But what rises instead is a skeleton, found buried beneath the property’s lone peach tree, and certain to drag up dire consequences along with it. For the bones — those of charismatic traveling salesman Tucker Devlin, who worked his dark charms on Walls of Water seventy-five years ago — are not all that lay hidden out of sight and mind. Long-kept secrets surrounding the troubling remains have also come to light, seemingly heralded by a spate of sudden strange occurrences throughout the town. Now, thrust together in an unlikely friendship, united by a full-blooded mystery, Willa and Paxton must confront the dangerous passions and tragic betrayals that once bound their families — and uncover truths of the long-dead that have transcended time and defied the grave to touch the hearts and souls of the living. Wow, look at that summary. Quite long, isn’t it? I think it provides enough background about the story and I don’t want to add anymore because I don’t want to give too much away. Going into the novel, I had a feeling it was going to be different from Sarah Addison Allen’s usual because of the mystery involved. It is a bit different in that sense and also because the subtle magic and the mouth-watering descriptions of food that has become Sarah Addison Allen’s signature was absent in this one. The usual themes of friendship and romance are still present though, which made me a very happy reader because those are what I love in her books. As with her other books, the perspective changes based on the two main characters, Willa and Paxton. Both of these women and even the men in their lives, Colin and Sebastian, went to the same high school together. It’s funny how they were never good friends when they were teenagers but their lives now intersect in ways that they never expected. All four of these characters went through big changes in their lives throughout the course of the book. My favorite chapter was the one called, “The Joker, The Stick Man, The Princess and The Freak”, when these four unexpectedly had a meal together and the fascinating conversation that ensued. I guess it’s not surprising that another favorite scene of mine was when there was a cameo from a Garden Spells character. I’ve said this before and I’ll probably end up saying it again: there’s something about Sarah Addison Allen’s books that make them good comfort reads. I’ve seen some people classify her books as chick lit or contemporary romance and while that makes sense, I find that her characters have much more depth than other characters in that genre. Like in The Peach Keeper, there is romance in the story but it was never the focus. It was more about the characters learning more about themselves and developing relationships that let them grow as persons more than anything else. The Peach Keeper is a delightful read and it’s the kind of book that I feel like I could recommend to just about anyone. I was afraid I was going to experience a reading slump because I wasn’t feeling the books that I’ve picked up lately. The Peach Keeper got me out of that almost-slump. If you’ve never read a Sarah Addison Allen (her name is quite a mouthful and I keep repeating it in my review) book before then you could start with this one. If you have recommendations similar to her style of writing, please mention it in the comments. I’d love to read more books like this. 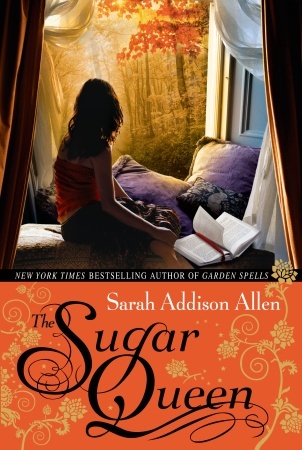 I enjoyed reading both Garden Spells and The Sugar Queen so I was looking forward to reading Sarah Addison Allen’s latest book. I have to admit that these books have made me more curious about magic realism. Emily Benedict came to Mullaby, North Carolina, hoping to solve at least some of the riddles surrounding her mother’s life. For instance, why did Dulcie Shelby leave her hometown so suddenly? Why did she vow never to return? But the moment Emily enters the house where her mother grew up and meets the grandfather she never knew — a reclusive, real-life gentle giant — she realizes that mysteries aren’t solved in Mullaby, they’re a way of life. Here are rooms where the wallpaper changes to suit your mood. Unexplained lights skip across the yard at midnight. And a neighbor bakes hope in the form of cakes. Sarah Addison Allen’s books usually focus on two main characters who are somehow connected. In The Girl Who Chased the Moon, these characters are Emily and her new neighbor, Julia. When her mother passes away, Emily moves to Mullaby to be with the maternal grandfather she never knew she had. Emily is surprised to discover that the small town doesn’t have a favorable impression of her beloved mother and she doesn’t understand why. While Emily, her mother’s troubled past and her forbidden friendship with mysterious Win Coffey are all interesting, I found Julia’s story much more compelling. I found Emily and Win’s relationship to be similar to most of the YA paranormal romances out there, including Win’s family secret. As a result, I was always eagerly anticipating the scenes that involved Julia. This would probably be a good introduction to YA fans who want to give SAA’s books a try because Emily is a teen. Julia can’t wait to leave Mullaby. She keeps telling everyone (herself included) that she’s in town only until she could sell the barbecue restaurant that she inherited from her father. She doesn’t have a reason for staying, least of all, her high school love and golden boy of Mullaby, Sawyer. I found Sawyer, with his Southern manners and insatiable hunger for sweets, charming. I can imagine him going, “CAKE! Nom nom nom nom.” Be sure to have food beside you when you read this book because it’s bound to make you hungry. Good thing we had a lot of food at home because of the New Year festivities. Overall, The Girl Who Chased the Moon is just as enchanting as SAA’s other novels and I gobbled it up during the weekend. It’s a story about family, friendship and food (all good things, in my opinion). I love reading SAA’s books and I can’t wait for her latest, The Peach Keeper, to come out this March. The Sugar Queen by Sarah Addison Allen was my Want Books pick a couple of months ago. I picked up Garden Spells first and enjoyed it so much that I decided to read this right after. Josey Cirinni is sure of three things: winter is her favorite season, she’s a sorry excuse for a Southern belle, and her passion for the man she loves is best kept a secret, even from him. Josey has grudgingly settled into an uneventful life in her mother’s house, but her one consolation is the secret stockpile of sugary treats and paperback romances she keeps in her closet. One morning, she opens her closet for a sweet, but finds Della Lee Baker hiding there instead. Della Lee is a local waitress on the run who is one part nemesis — and two parts fairy godmother. Under Della Lee’s guidance, Josey is soon living in a world where the color red has startling powers, and passion is so real it can make eggs fry in their cartons. And that’s just for starters. 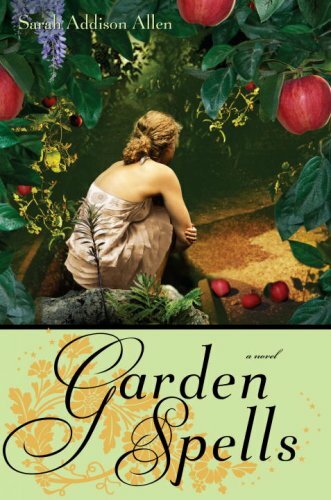 Sarah Addison Allen has been added to my auto-buy list after I finished reading Garden Spells and I really enjoyed reading this one even though I had some problems with it. I loved that this is set in autumn/winter and that Josey loves snow because I’ve never seen or experienced snow. The setting made the book a good read for December. 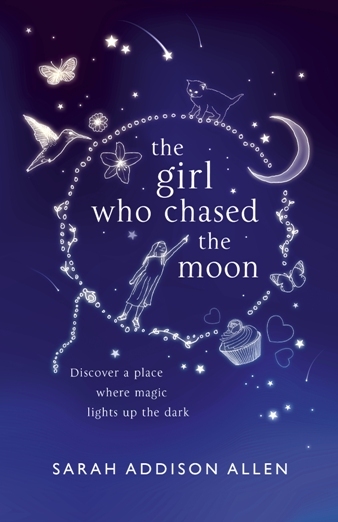 Can’t wait to get my copy of The Girl Who Chased the Moon, I ordered it from the Book Depository two weeks ago and it still hasn’t arrived. Garden Spells by Sarah Addison Allen has been recommended by several people – namely Celina, Angie and Michelle. It’s a book that falls under the genre magic realism and I don’t think I’ve ever read anything like it. Welcome to Bascom, North Carolina, where everyone has a story to tell about the Waverleys. There’s the house that’s been in the family for generations, the walled garden that mysteriously blooms year round, and the wild rumors of dangerous loves and tragic passions. Claire has always clung to the Waverleys’ roots, tending the enchanted soil in the family garden from which she makes her sought-after delicacies. She has everything she thinks she needs, until one day she wakes to find a stranger has moved in next door and a vine of ivy has crept into her garden… and Claire’s carefully tended life is about to run gloriously out of control. What a lovely surprise Garden Spells turned out to be. I’ve had my copy for several months now and I only felt the urge to pick it up this weekend, when I felt like I could use a bit of magic in my reading. It looks like I’m going to become a fan of magic realism because I like that it’s mostly contemporary fiction with just enough magic sprinkled in to make things more intriguing. The Waverley women have always had a hint of magic in their blood. 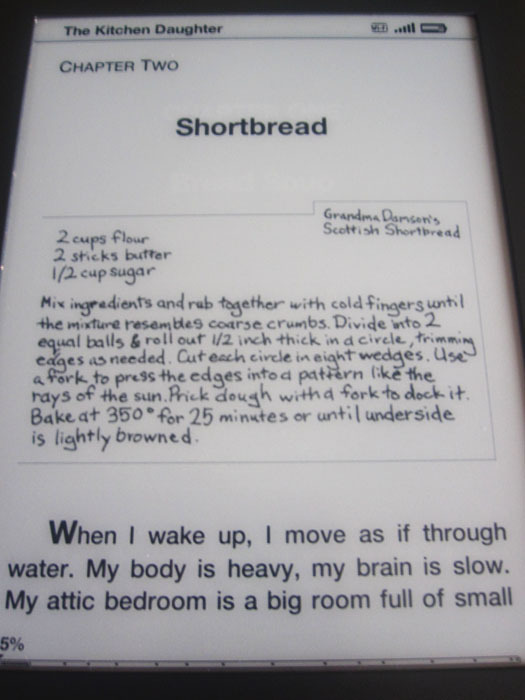 In Claire Waverley, this comes out in her cooking. She has the power to influence how other people feel by using flowers and plants from the Waverley garden. The apple tree in the garden is famous because when a person takes a bite from one of its apples, they see the biggest point of their life (good or bad). Claire embraced her Waverley roots early on but her younger sister Sydney feels the opposite. Sydney left town as a teenager, just like their mother did, but she’s realized that Bascom, North Carolina is still home. Out of the blue, she comes back home with her young daughter in tow. Claire welcomes them even though she’s afraid of change and that they’ll eventually leave her again. This book was a delight to read. It’s the sort of book that will probably become a comfort read in the future. It’s also a perfect gift for female relatives and friends because it’s light and there’s a bit of everything in it – some romance, a little magic, small-town gossip and family issues. It will also make you hungry because there are a lot of references to food due to the nature of Claire’s work (she’s a caterer) and her Waverley magic. I like how both Claire and Sydney developed as characters throughout the book. Claire’s a shy, reserved person who’s afraid to let people in because she has abandonment issues. Slowly but surely, she learns to open herself up to the people who matter the most. While her sister Sydney starts putting down roots and learns that being a Waverley isn’t as bad as she remembered. The minor characters in the book are also well-developed and I like how they flesh out the story. Even the Waverley garden (the apple tree in particular) has a mind of its own. I highly recommend this book and if Sarah Addison Allen’s other books are just as good as this one, then I’d be more than happy to read them. I have a confession to make. I’m afraid of ghosts and spooky stories in general. I don’t like hearing horror stories or watching scary films. So when I first saw Angie’s Retro Friday review of A Certain Slant of Light, I didn’t want to read it. I mean, would you look at that cover? It’s enough to make the scaredy-cat in me afraid. It wasn’t until Holly assured me that this wasn’t a scary book did I decide to give it a try. Good thing it’s available in Fully Booked for P378. For some reason, I thought it’ll be harder to find a copy of it. In the class of the high school English teacher she has been haunting, Helen feels them: For the first time in 130 years, human eyes are looking at her. They belong to a boy, a boy who has not seemed remarkable until now. And Helen – terrified, but intrigued – is drawn to him. The fact that he is in a body and she is not presents this unlikely couple with their first challenge. But as the lovers struggle to find a way to be together, they begin to discover the secrets of their former lives and of the young people they come to possess. Helen is a being of Light. Yes, that means that she’s a ghost and for several decades, she has existed in this world by cleaving to different hosts. She stays near her hosts because otherwise, she’ll be pulled back to the depths of what she believes is her personal hell. No one sees her or hears her and she’s gotten used to that fact. Until a boy in her host’s class looks at her directly. Turns out James is also of Light and he’s started occupying a high school boy’s body when the boy’s spirit vacated it. Naturally, both Helen and James are curious about each other because they’ve never met anyone else like them. Thus begins an unusual romance. This is a beautiful, beautiful book. A couple of chapters in and I knew I was going to love the writing. Here’s a sample of one of Helen and James’ early conversations. They’re in the library, discussing Billy’s homework which James needs to revise. Billy is the high school boy who James has possessed. “It smells familiar,” I suggested. “It smells like words.” Because his left side was to me, I couldn’t easily take his hand to write. “Books are boring,” James said as he wrote. “They line the walls like a thousand leather doorways to be opened into worlds unknown,” I offered. “A sea of dreams trapped in a span of pressed pages,” I said. Lovely, isn’t it? You can see Helen’s love for the written word reflected with those few lines. It is because of this love that she has cleaved to literary minded hosts. The story is narrated from Helen’s point of view and because she comes from a different time, her words lend a certain old world feel to the entire book. It’s always a pleasure to read a book with a main character who loves to read. Similar to how James found Billy, Helen discovers Jenny, a teenage girl empty of spirit. As Helen and James get to know each other better, Helen struggles to live Jenny’s life and comes to understand what has caused Jenny’s spirit to fly away. It was amusing to watch both Helen and James cope with modern life – the slang used by teenagers, food that they never got to taste when they were alive like pizza and root beer, the posture and gestures common to present day situations. Aside from that, they also try to understand why they’ve been unable to move on from this world and why . I wonder why this book isn’t more well-known? 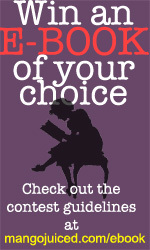 It is a delightful book with a unique premise and relatable characters. I haven’t read anything like it. I’m also continually amazed at how YA novels touch on serious topics such as loneliness and redemption without the heavy feeling that usually comes with reading things like these. 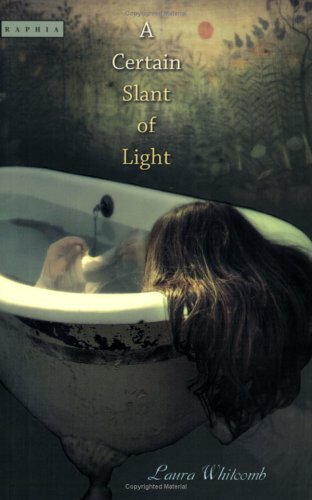 In spite of the unusual aspects of the book like having a ghost as its main character, A Certain Slant of Light is a love story at its core. I hope more people get to read this one. Has anyone read Laura Whitcomb’s other book – Fetch? I’m curious of that book is just as good as this one.